He looked as if he had been hit by a Sherman tank and I just could not believe my eyes. 2017 marks the 50th anniversary of Richmond’s 1967 Premiership success – a premiership that ended a 24-year drought for the Tigers. Sound familiar? And in the aftermath of Trent Cotchin’s non-suspension for his bump on Dylan Shiel in the Preliminary Final last weekend, it is worth reflecting for a moment on the story of Neville Crowe in the lead up to that 1967 Grand Final. Neville Crowe, Richmond’s first choice ruckman at the time, missed out on the euphoria of the 1967 Grand Final win due to being suspended for a strike on John “Big Nick” Nicholls in the Semi Final win against Carlton. Referring to the hit on Nicholls as a strike is probably an overstatement, more an open hand slap. Regardless, contact appeared minimal or non-existent depending on who you asked. Crowe was subsequently suspended for 4 games (his first suspension in an 11-year career) and was in tears leaving the Tribunal hearing, his dreams of playing in a Grand Final extinguished. I’ve included footage below (watch the last 30 seconds of the video) – so you can decide for yourself whether Crowe deserved to miss the Grand Final. But what did Big Nick have to say for himself? Unfortunately his version of events that he recounted in his autobiography offered little as to whether he took a dive or not. Although, even if he did offer an explanation to his dramatic collapse to the ground, I would question the accuracy of his account, as he couldn’t even correctly recall who the player was that hit him. Nicholls claimed it was Craig McKellar that hit him, even though McKellar didn’t start playing league football until 1971! And as for Neville Crowe, he never played league football again. Not to be outdone, the Crows are celebrating an anniversary of their own – 20 years since they first raised the Premiership Cup. Adelaide won the 1997 flag in only their 7th season in the competition and in Malcolm Blight’s first season in charge. And although in completely different circumstances to Neville Crowe their was also heartbreak within the Adelaide team. Adelaide’s champion full forward Tony Modra, in a season where he had kicked 84 goals, broke down with a serious knee injury in the Preliminary Final against the Bulldogs. Parallels can be made to Brodie Smith when he sustained a ruptured anterior cruciate ligament (ACL) in his right knee in the Qualifying Final a few weeks ago, ending both his season and his 2017 Grand Final dreams. 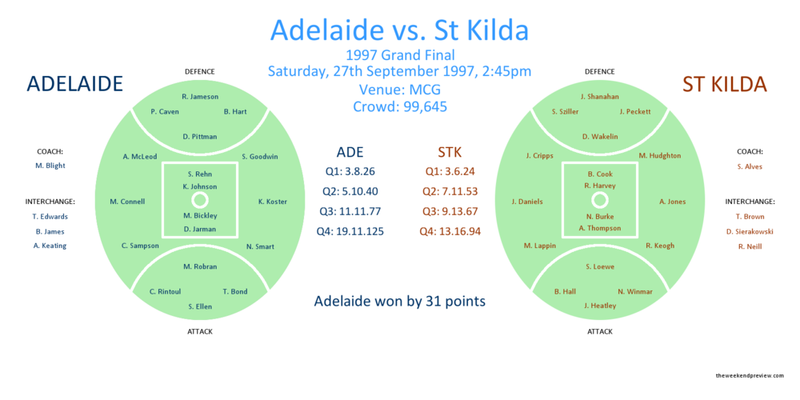 However, Adelaide entered the 1997 Grand Final against St Kilda not only without Modra, but without Peter Vardy (28 goals for the season in his second year at the club, eerily similar to the injured Mitch McGovern this week, with his 32 goals in his second year at the club) and a young Mark Ricciuto among other first team regulars. But rising on the big stage was the mercurial Darren Jarman (6 goals), the journeyman Shane Ellen (5 goals) and the brilliant Andrew McLeod whose inspired second half performance took the game into Adelaide’s control and earned him a Norm Smith Medal in the process. Adelaide’s opponent that day, St Kilda, entered the Grand Final in top form (on a 9-game winning streak) and was attempting to end a long Premiership drought (31 years at the time), not too dissimilar to Richmond this year. Can Adelaide break the heart of a success starved football club again? Of course Adelaide would go on to win back-to-back premierships, with Vardy and Ricciuto experiencing in 1998 what they missed out on the previous season. Not so, Tony Modra. After battling back from injury and returning to the senior side in Round 16, Modra was dropped after the Qualifying Final loss to Melbourne. After missing out on a premiership a second time, he never played for Adelaide again. As for the Grand Final itself this week, we are presented with the age old debate, does attack or defence win premierships? In one corner we have the best attacking team in the AFL (Adelaide) and in the other corner we have the best defensive team in the AFL (Richmond). Adelaide averaged 110 points per game in 2017 and were the only team to average over 100 points per game. When it came to attacking they were by far and away the best. Whilst Richmond’s defence, led by All-Australian Full Back (and All-Australian Captain) Alex Rance have conceded on average only 75 points per game in 2017, ranked Number 1 in the AFL. Let's evaluate both team's attack and defence in more detail. 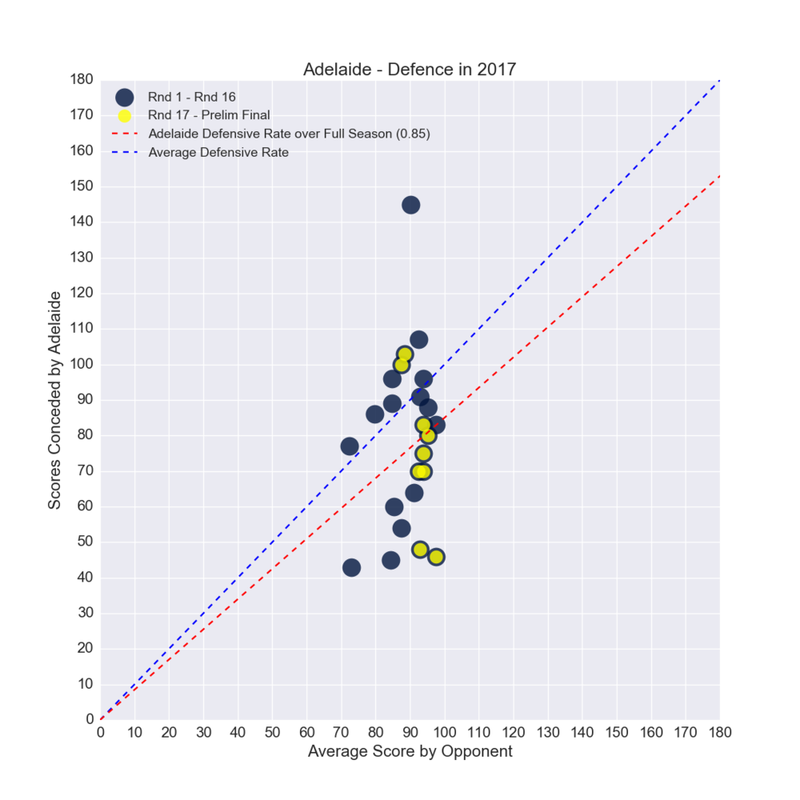 Figure-3 and Figure-4 present an overview of Adelaide’s overall attack and defence in the 2017 season. 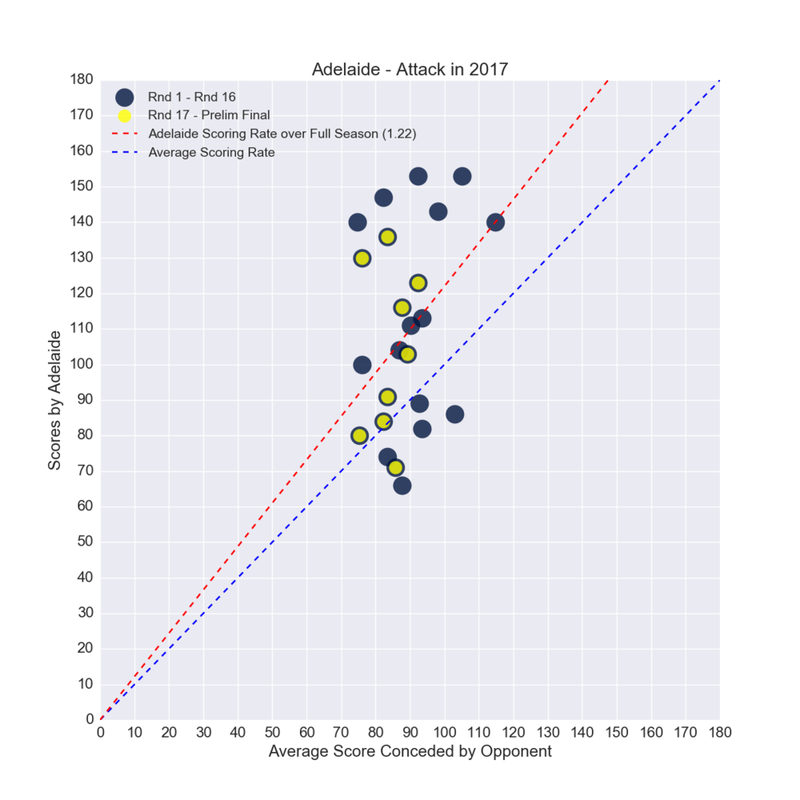 The plots present all 24 games Adelaide has played during the 2017 season (including finals) and indicates how they scored/defended compared to the averages of their opponent. The figures also provide an overall trendline indicating how much they on average played below or above expectation. In attack, Adelaide scored 22% more points on average than what their opponents usually concede, indicating how hard they are to stop from scoring. But their defence is potentially a little underrated. They on average restricted their opponents to a score 15% below what they usually score. This balance between attack and defence is reflected in their very high home & away season ladder percentage of 136.0%. Figure-3 and Figure-4 also highlight the performances of the Crows in the final part of the season (nominally taken as from Round 17 onwards). Their top end scoring has dropped off, but their defence has improved. 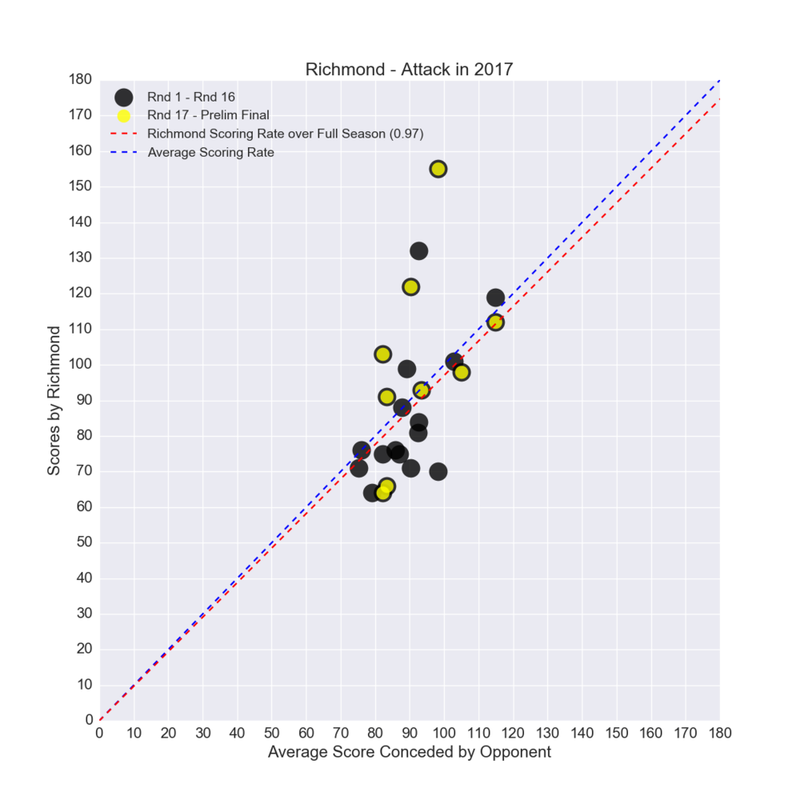 Figure-5 and Figure-6 present an overview of Richmond’s overall attack and defence in the 2017 season. Similarly to the figures presented for Adelaide, the plots present all 24 games Richmond has played during the 2017 season (including finals) and indicates how they scored/defended compared to the averages of their opponent. In terms of their attack, the Tigers were just below the average expectation – scoring 3% less points on average than what their opponents usually concede. But it is the Tigers defence that is their big strength, restricting on average their opponents to a score 19% below what they usually score. 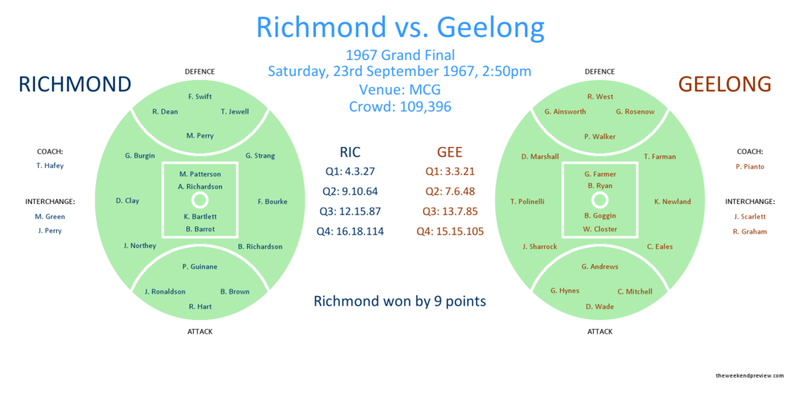 However, it is the Tigers performance in the final part of the season (Round 17 onwards) that is worth noting, whereby the Tigers have had both their best performances for the season in attack and defence. The Tigers appear to be peaking at the right time. On overall balance, Adelaide is the better side and if the game turns into a shootout, then the Crows will win. And even if the game stays tight, Adelaide will always have the capability to quickly kick 5 goals without reply and break the game open. Adelaide would be fitting premiers given the season they have had and the hardships they have had to endure over the last few seasons. But, their is a momentum that the Tigers have built over the past month that is undeniable - the pressure levels they have been able to exert on their opposition, the defensive stranglehold they have had on opposition forward lines, the incredible crowd support, a captain playing like a man possessed and a newly crowned Brownlow medallist that appears unstoppable at the moment. If the Tigers can maintain the pressure they exhibited in their finals against Geelong and GWS (and I believe they can), then the Tigers will win. This remarkable AFL season is destined to have one last dramatic Act that will result in the 2017 season being forever remembered as The Year of the Tiger. As an impartial fan that has embraced the feel good story that is the Tigers, I feel I should offer a closing warning for all neutral supporters this weekend that are getting on the Tigers bandwagon. After not even playing a single Final for 20 years until 1967, the Tigers went on to be the dominant team of the next decade, winning 4 premierships in 8 seasons between 1967 and 1974. Hence, we should be careful what we wish for. Roberts, M., Winkler, M. (2003). “Footy in the 1960s: Six games on a Saturday”, Hardie Grant Books, South Yarra, Australia. Nicholls, J. & McDonald, I. (1977). “Big Nick”, Garry Sparke & Associates, Victoria, Australia. Zurbo, M. (2016). “Champions All: A History of AFL/VFL Football in the Players’ Own Words”, Echo Publishing, Victoria, Australia. Bartlett, K., Bartlett, R. (2011). “KB: A Life in Football”. Slattery Media Group, Victoria, Australia.